One of the vital elements of our organisation is the participation and involvement of each volunteer in our local community. Our Volunteers help us work towards our mission of making a positive difference to the lives of young children. Our work focuses on early childhood development in Ethiopia and Tanzania. This helps gives each child the best start in life, giving them more choices later in life. We also work in Ireland and the UK. Our Development Education department is working hard in schools using their holistic approach to education: ‘Educating the Heart‘. Their goal is to create a more compassionate future. By promoting active global citizenship in schools we can work towards the eradication of the structural causes of poverty. Just like our work, our voluntary roles take on many forms. We have roles available within our office from Fundraising to Development Education. You choose how to spend your time. Donate a few hours a week or month or inquire about our internship opportunities. Our community fundraisers are always on the lookout for like-minded people to donate a few hours of their time to help at events. Below you will find information on the various ways in which you can get involved or why not organise your own fundraising event! Children in Crossfire will support you in your planning. Our community fundraisers will provide you with top tips to help you smash your targets. 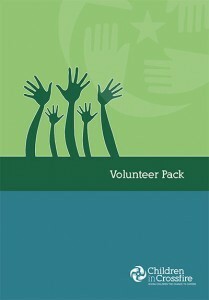 The above pack is designed to give you lots of information on how you can go about volunteering for Children in Crossfire. You will find out more about how you can help us, hear from existing volunteers about their experiences. Call us on 02871 269898, or email ursula.moore@childrenincrossfire.org if you’re interested in volunteering with us.